Your week in day in great detail. I’ll admit, I have been dreading these final 30 Day Challenge posts. My week in great detail? My week really isn’t that fascinating, but I suppose I could try to be creative and make it sound fun and interesting. I think since today is Monday, I should do my past week, which also happened to be my last week at both FIT and Elle for a few months. Monday, May 17: I didn’t have class until 5 pm, where I only had to hand in my final paper, so this was a lazy Monday, the best kind. I decided to go for a run in the gym to relax before my week of stress and studying. After, I handed in my paper to my Strategic Planning teacher, he decided to read it then and there while I watched nervously. He said that he was very impressed by it, garnering my paper an A. Later I began studying for my Psychopathology final exam which would take place Tuesday at 6:30 pm. Then I was in my friends fashion show dressed up like a “Sleeping Beauty” which was pretty fun and then I went out with another friend for sushi. This is where I discovered sweet potato tempura rolls, a new obsession of mine. Tuesday: I had my Workshop in Direct Marketing presentation at 9:30 am. It was a 30 min presentation in front of a panel of esteemed judges, who were not afraid to interrupt the presentation to ask questions and comment. Then at 1 pm my photographer godfather, William Heuberger, took a picture of some of my friends and I for a project he is doing on FIT students. After this I had to run to a lunch for new student tour guides, where I managed to eat a lot of lunch. Directly after this I had my last Creative Fashion Presentations class, where we looked at pictures and critiqued our amazing fashion show that we put on last Tuesday, which went flawlessly. Then, since I couldn’t focus on studying for my exam, I went to the gym for about 40 minutes. My Psychopathology exam began at 6:30 pm and I was finished by 6:38 pm. It was 25 multiple choice questions, and I studied for hours so I was not happy that it only took me eight minutes. I studied for my morning exams for a few hours then paused to watch Glee and The City (only because they film it at Elle and I might have a cameo on it). Wednesday: In the morning I had my Biology final exam, which was fairly easy, and then I had my Journalism final exam about an hour after it. Since I was done with my freshman year at FIT I just lounged around the dorm reading magazines and catching up on tv that I had missed over the past few weeks. That night my three roommates and I went out to dinner, as our last night together, at Serendipity, a.k.a. one of my favorite places in New York. 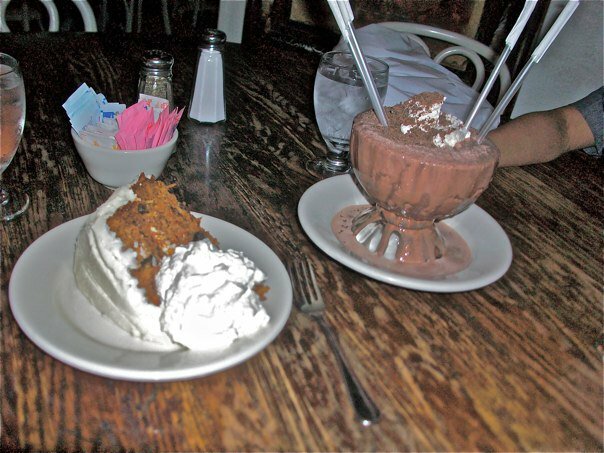 Carrot Cake and Frozen Hot Chocolate from Serendipity. Thursday: I had my second to last day at Elle today and had to train new interns for the fashion closet. It was a busy day but so much fun. I was really sad that the next day was my last. Friday: My last day at Elle was bittersweet because I was obviously sad to leave, but it was such an amazing experience and I was happy to be able to go home for a few months to relax. I met one of my roommates after work to go shopping in Herald Square and then we had amazing thin crust pizza and frozen yogurt. That night, we packed for a few hours then had a mini Friends marathon. Saturday: One of my roommates moved out early Saturday, so I was up since 9 am. Then after cleaning my room, packing and showering my mother and brother arrived to move me out. It was a bit stressful, but we were able to go to Whole Foods to pick up some of my favorite foods that I can’t get in Connecticut and we bought 30 bagels from Brooklyn Bagels, which I had the pleasure of holding on my lap for the 2 hour car ride home. Needless to say I ate one. Sunday: Sunday was a leisurely day consisting of bagels and CBS Sunday Morning. Then my best friend came over and we attempted unpacking my things, which resulted in getting two of my 12 bags unpacked. Then we decided we are going to repaint my room this summer and rearrange it. I also discovered that I have eclectic taste when it comes to room decor and that I want my room to look like a Parisian Anthropologie catalog. I ate two dinners this night, one from my favorite Chinese restaurant and the other at my friends house, which consisted of homemade pesto pasta and salad. Then I finished the night with my first trip to Dairy Queen of the summer and my new book The Girl who Played with Fire, by Steig Larsson. So that is basically my week in great detail. I hope it was interesting and gave a sliver of insight into my life, my Type A personality, love of food and, of course, fashion. Really? I want to go to England so badly! It sounds amazing…shall we switch?